And now, I have it. So, I’ll be importing it into iTunes for the rest of the evening. Thank you all for your kind words on my sewing projects. They are lots of fun, and I might just keep making them. Who knows, maybe there will be an Etsy shop in my future. Either that, or everyone I know is going to end up with one whether they want it or not. September 10th, 2008 | Tags: Memes, music, Sewing | Category: Misc. Good for you!! Let’s see if I can name the ones that are missing from the picture: 52nd Street, The Bridge, and River of Dreams. Right? 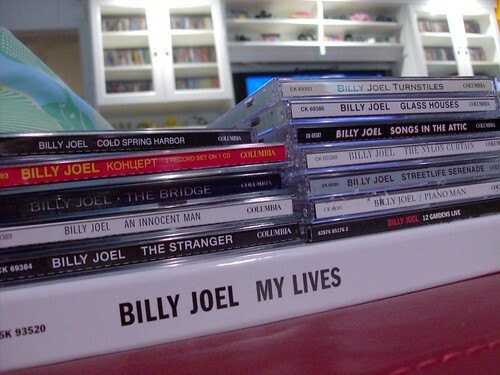 I think I’m going to have to have myself a little Billy Joel fest with the iPod at work tomorrow. Billy Joel is on my list of “drop anything to see” artists. It has three spots. Don’t make me pick a favorite. Awesome collection. “Innocent Man” and “Glass Houses” were the soundtrack of my childhood. My mom was a huge fan and now, so am I. I remember being about 4 years old and my favorite song, which I knew by heart, was “Christie Lee”. Rock on, Billy Joel.